"Her singing is as highly charged as ever and her writing as pointed and witty." "...a quietly compelling album of songs that took a lifetime to be able to write and sing. A most eloquent and rich album." "This album is a revelation. 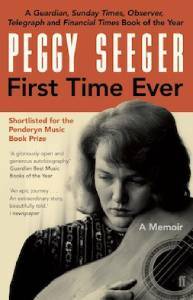 Throughout her lengthy career, Peggy Seeger has proved that she is a thoughtful songwriter with an easygoing voice that offsets her often angry lyrics, but here she explores new, pained and personal territory, and does so with delicacy and soul. Listening to her relaxed, often acrobatic vocals, it's hard to believe she's 79." "In every way, shape and form, this is a remarkable album. It's an album which makes some stern demands on you. But that's nothing to the demands it makes on Seeger herself. The fact that she meets them all with such relish, confidence and conviction make it very special." 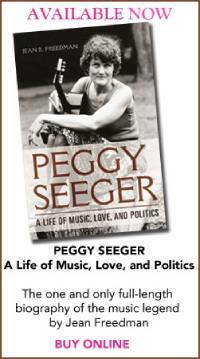 "Peggy Seeger is a monumental figure in folk and modern music but this proves that she is still vibrant and relevant. This is definitely Peggy Seeger at her best." According to The Bookseller, First Time Ever is the #1 most picked non-fiction book in the yearly roundups. Also available as an audio book, read by Peggy herself. A double CD set designed as an audio accompaniment to the memoir. 38 songs are included in the order in which they are mentioned so you can listen to the songs chapter by chapter. Available as a download or physical CD. Here’s a blogger who is reviewing a whole stack of Ewan’s records.